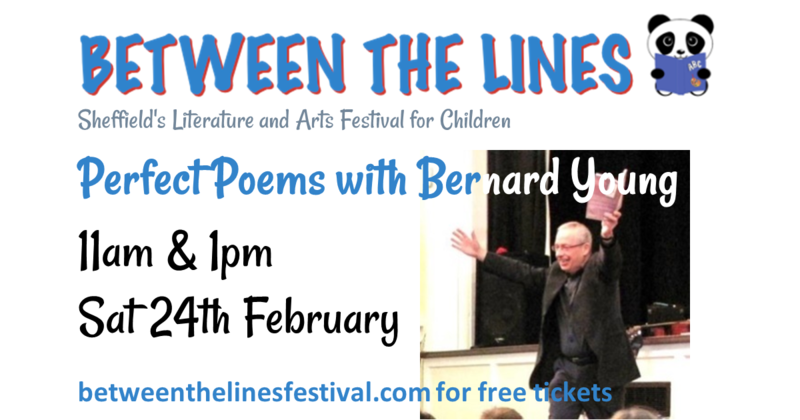 I am pleased to be one of the writers at the very first Between the Lines Festival in Sheffield on Saturday 24th February. It is Sheffield’s Literature and Arts Festival for Children. I will be performing and running workshops for children with adults during the day at The HUBS, 6 Paternoster Row, Sheffield, S1 2QQ. My sessions are at 11am and at 1pm. I will also be launching my new book, “What Are You Like?”, with signed copies available to buy. Free tickets can be booked using the links below. I really thought I was going to be late. 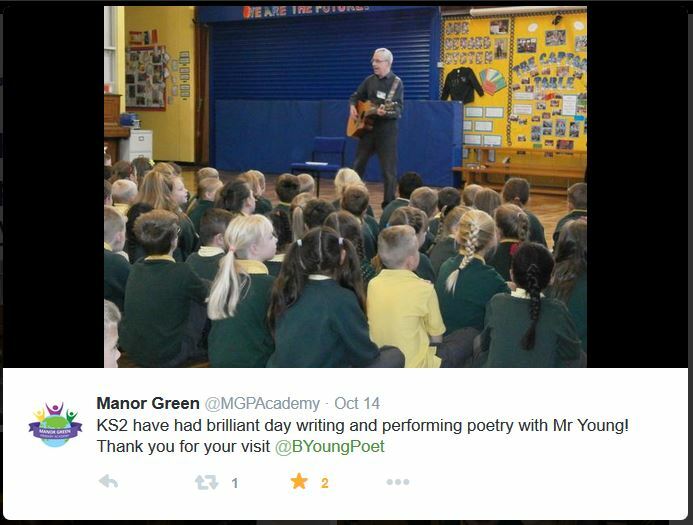 At 9.15 a.m I was due to perform to KS2 at Manor Green Primary Academy and my 4 mile journey ended up taking 45 minutes to complete. But I did make it with a few minutes to spare and was, after signing in, immediately presented with a cuppa. A good start. Obviously I performed Traffic Jam as well as Explode, Brilliant, Orange Socks, Lollipop Lady (plus many more poems) before finishing off with a lively rendition of Ref Rap. Thanks (pupils and staff) for listening so well and for the enthusiastic participation. The rest of the day was spent leading hour long workshops in the hall (two classes at a time) with children working on their own, in pairs or larger groups. They worked well and within that hour I shared writing ideas, they wrote and we ended each session by listening to many of their new poems. A massive amount of poetry was composed that day. Thanks to all at Manor Green for being so enthusiastic. I enjoyed my time with you and hope to see you again. Perhaps KS1 next time? Lesson Planning For Next Term? Inviting A Performance Poet To Your School? 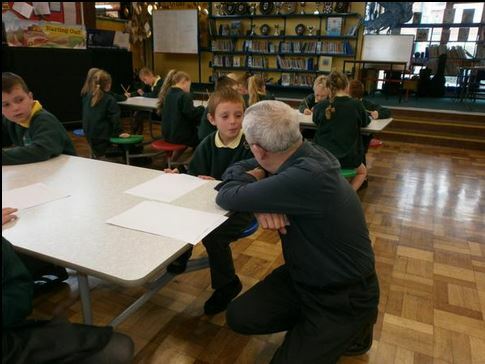 A poet in your school? Why not? The right poet (I mean me! 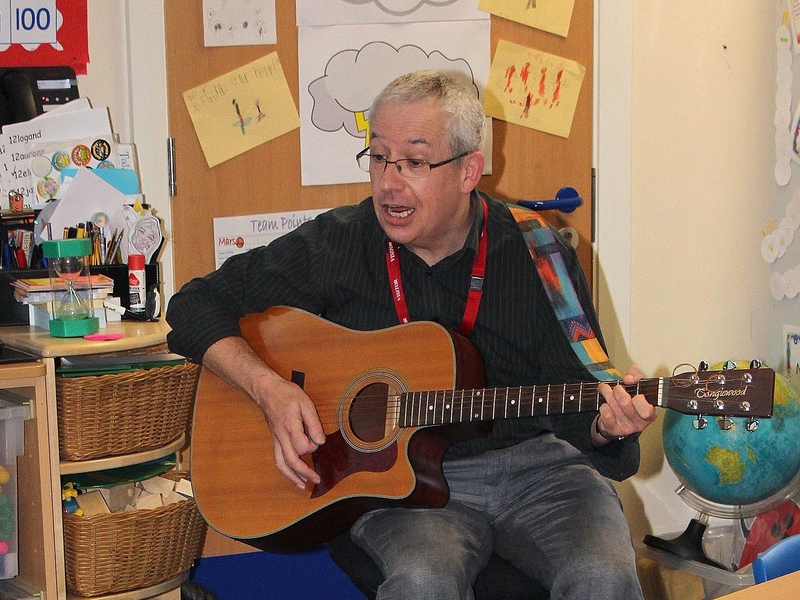 but there are lots of us) can offer an exciting start to your school day (I include guitar and just enough joining in during my morning assembly performances). The children head off to classes with loads of writing ideas already in their heads and I then work with all ages throughout the day. Teachers tell me that having an enthusiastic practitioner of the art in the classroom has a tremendous effect on them and the children. Together (teachers, children, poet) we produce fantastic new poems and usually share them before home time. After that we all go home (apart from the teachers who have yet another after-school meeting to attend). For some ideas for bringing poetry in to the class room see my collection of blog posts on the subject – classroom ideas. Another way is to have a look at some of my videos on YouTube. They can be used for a sing along break during the day, or as a springboard for other poems using the same patterns. If you want to discuss what I could do in your school and what it will cost, please contact me. Barmouth is turning into quite the cultural hotspot, that I’m happy to be a part of. Not only am I on the bill at the Open Day of St Johns Hall Gallery on 20th August, and running two poetry workshops there on 18th August, but now I’m also performing in the evening of 18th August at the Aber House Café. The event at Aber House Café will start at 7pm on Monday 18th August and is free, with the option of buying the usual café fare of drinks and cakes. I’ll be joining another Barmouth-based writer, Mary Howell, who will read extracts from her book Murielle’s Angel – a novel set on the Way of St James, the Camino de Santiago de Compostela. I’m compiling a ‘set list’ mix of old and new poems to perform, some humorous, others thought provoking, and I’m looking forward to meeting a new audience. I’m reliably informed that there will be Viennese Delights and the very special Tarta Santiago to tempt you (if the literary delights alone are not enough!). So if you’re in the vicinity of Barmouth on 18th August, I do hope you’ll join us. If you’re in Barmouth on Wednesday 20th August you may see a dancing Chinese lion, giant puppet, bubbles and exploding custard, amongst other things. There’ll be a carnival feel when St Johns Hall Gallery will be holding an Open Day event and procession to celebrate the launch of the Gallery as a not-for-profit Community Interest Company. 1-6pm there will be a variety of live music and entertainment, poetry and puppetry, films and performance. 7:30-10pm a free entry evening of eclectic music and poetry. “I want the Gallery to be a dynamic centre connected with Art in its widest sense, a place that draws the enormous pool of creative and intellectual talent in Barmouth and the surrounding area. 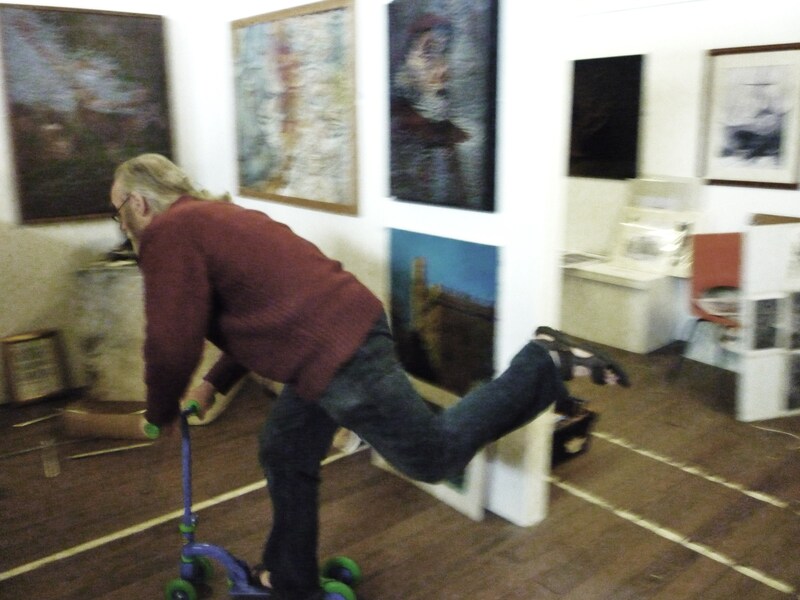 A place where all kinds of people can come to be inspired, create, discuss, perform, display and share their ideas.” says Bernard Barnes, artist and curator of the Gallery. I will be part of this extravaganza, reading and performing a few of my poems for a family audience in the afternoon and for adults in the evening. Barry Lim will be dancing the lion and hosting/performing the music evening. 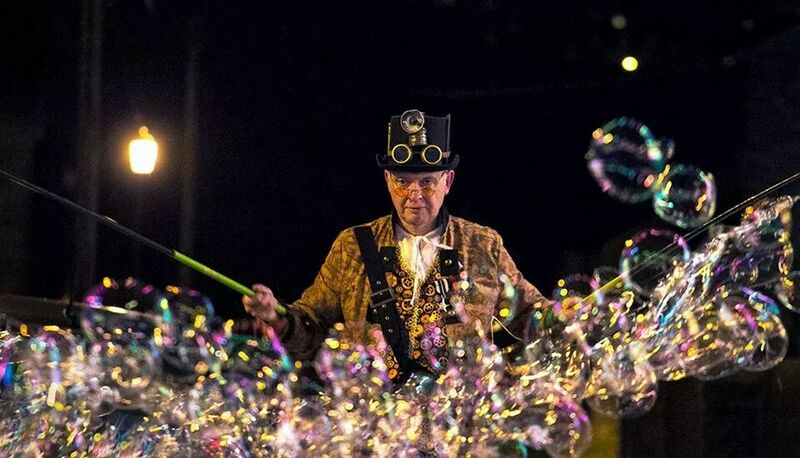 Ian “The Bubbleman” Russell will be making his huge bubbles and exploding custard. Bernard Barnes will be giving a talk in the afternoon about the ideas and themes behind his huge wall painting “The Captives of the Cosmic Web”, 24 paintings on the North wall of the Gallery measuring 20′ high by 28′ wide . I was very fortunate to be one of 120 people in the intimate audience at Hunmanby Community Centre last night for a poetry evening. 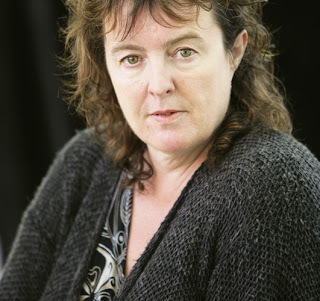 Carol Ann Duffy, one of the most significant names in contemporary British poetry, read a selection of her older and more recent work, accompanied in a couple by the very entertaining woodwind musician, John Sampson, who also performed in her breaks on an abundant array of older and more recent woodwind instruments. As I’d had the tickets for some time, in preparation, I had been rereading my Carol Ann Duffy collection, and was pleased to hear her perform some that were already familiar to me. I was enlightened by her introductions, explaining where she drew her inspiration and what references and nuances there were in the words. I particularly like her use of list-like poems and admire her word craft, how she places rhymes in less formal spaces… and her comic timing. I hadn’t realised that “The Counties” (in “The Bees”) was a protest inspired by the Post Office’s campaign to lose the county from postal addresses, because of its distraction from the post code. I’m sure I’ve drunk in a lot of the traditional pubs listed so fluidly in “John Barleycorn”. Carol Ann read quite a few others from her last published anthology (“The Bees” 2011), which has a thread running through of the environmental concerns of the loss of bees. “The Human Bee” (in the title of this post) refers to people in China who have the job of pollinating fruit trees by hand because they have no bees to do it any more. 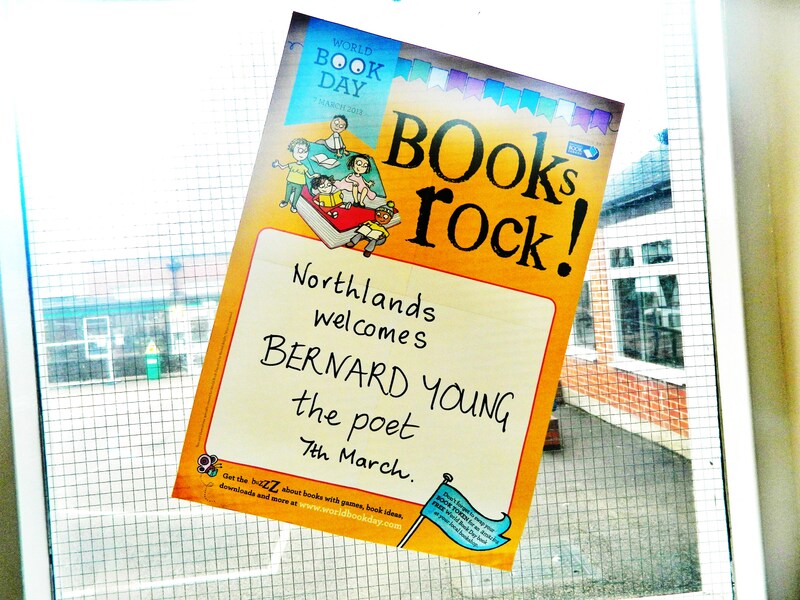 A big thank you to Northlands Primary School, Rugby for delaying World Book Day by 24 hours. Car trouble prevented me from getting there for the official event and, just like that, the school happily moved my visit to the following day. As the photograph illustrates, on a snowy day the welcome couldn’t have been warmer. I worked with all age groups and we had a brilliant get together before school ended to listen to new poems written and performed by the children. It was fantastic that we were joined by many parents for that. Thanks again to the school for looking after me so well and producing some great poems. In 2012, UK National Poetry Day is on Thursday 4 October. The theme is STARS. Be a star, read, write or buy some poetry. This is a new song, written to order. Cats are always a popular topic and this one seems to work well even with younger pre-school children. Did some more recording at the weekend, and my good friend Karen has made another video for me. It’s a lot of fun making these and all with easily available equipment and software. Captures the warm weather, don’t you think?